CHEETAH is an acronym for Chains of Human Intelligence; towards Efficiency and Equity in Agro-Food Trade along the trans-Africa Highway. It amplifies the voice of value chain players (Transporters, Consumers, Growers, Officers from public and private agencies) by allowing them to communicate value chain shortcomings. The app also enables players to tap into chains of horticulture intelligence, which leads to better-informed decisions. This in turn reduces costs and increases profits for businesses, leads to lower market prices for consumers, fairer prices for growers, and better interventions by public and private agencies. CHEETAH is developed by Ujuizi Laboratories, a spin-off company of the Faculty of Geo-Information Science and Earth Observation (ITC), University of Twente, in collaboration with several other ICT experts. Join CHEETAH and contribute your observations on the Ghanaian roads using our location-aware CHEETAH App! Download from the Google Play Store to get started! Profit = ƒ(T, H, L, Dur, Rq), with T = temperature, H = humidity, L = Light, Dur = journey duration, and Rq = Road pavement quality. Dur is provided by Cheetah (crowd-sourced); T, H and L are derived from satellite data (Copernicus Sentinel-4 and MSG-3). Rq is provided by the smartphone motion sensor data (crowd-sourced). Cheetah Food is obtaining crop-sourcing information from Copernicus Sentinel-2 land cover and crop phenology products. Market price information is partly crowd-sourced augmenting by existing third-party crop market value services. 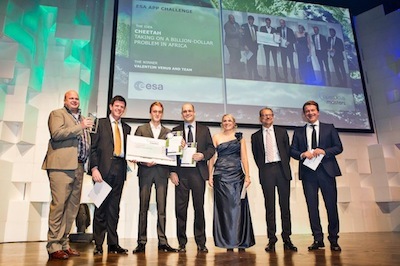 Cheetah won the ESA Copernicus Masters App Challenge 2013!